Google search is one of the widely used stuff online. People can’t live a day without using Google search. The frustrating thing is, even though there are millions of people who actively use Google search but most of them don’t know how to use it effectively. 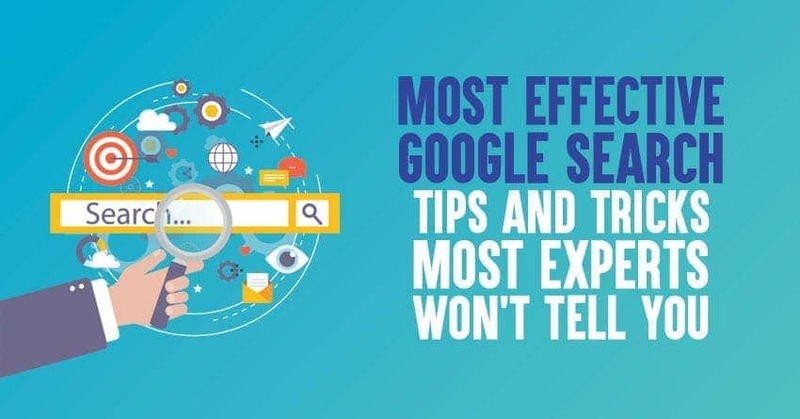 If you’re looking for the most popular Google search tips and tricks, this detailed post is for you where you’ll discover 10 of the effective Google search tips and tricks that can save you a lot of time. This post is written by keeping two kinds of people in mind. So let’s begin with the first group first. Then, we’ll talk about some of the best Google search tips and tricks that can be used by bloggers and marketers to grow their search traffic. Are you ready? Let’s jump into the details. So how do people usually search on Google? They have to open their browser, go to Google and enter a keyword to search for a specific product or information. That involves in a lot of steps, right? Not only it’s time consuming but also not much effective. To solve this issue, Google came up with a new idea called Google voice search (it’s becoming a trend these days and more and more people are now using Google search by voice instead of typing on Google to find information on web). Voice search is simply a technology that is based on speech recognition. Voice search allows you to search by speaking instead of typing so you can save a lot of time while browsing web through your smartphone or laptop. Why voice search is becoming essential? Did you know that voice queries (using Google Now) likely to show almost 45% rich and highly valuable content to the users compared to 40% for text queries? Just check out the following illustration to understand the importance of voice search which is one of the best Google search tips and tricks you can implement in 2019. How to use Voice search by Google? To search the web by speaking, simply tap the microphone button on the Google search box on your home screen, or press down for a few seconds on the physical search button on your phone to activate the “Speak Now” screen. You’re done. Google Voice Search which is also known as Search by Voice is one of the Google innovating products that allows you to use Google Search by speaking on a smartphone or computer. #1. Find out how many pages are getting indexed within a site: Did you know that you can easily use Google search to find out how many pages are getting indexed by Google search crawlers within a website? You can also easily find out your overall website pages that are getting indexed by crawlers. Here’s a simple illustration of it. In the above example, you can notice that, just by entering the Google search tip “site:mysitename”, it’s showing about 700 results (those many pages are getting indexed on Google for my site Bloggers Passion). Likewise, you can easily find out the results for any other website in the world. #2. Search within a particular website: Do you want to search within a particular website (of your own site or your competitors sites)? This is one of the best Google search tips and tricks you can use if a site is NOT using a search form within it. Here’s what you need to do to search within a site to find whatever you are looking for. See that? You get all the SEO related content (that’s what we used in the above example) for the blog Bloggers Passion. You can repeat the same thing for any other website in the world to get information. #3. Find related websites quickly: Do you want to know the relevant and similar search results for a particular website. You can do so easily with the following command. Just enter related: on Google search to look up for the related results of a particular site. #4. Use quotes while searching: If you want to search for an exact phrase, use quotes. “Google search tips and tricks” will only find that exact phrase. Google “tips and tricks” will find pages that contain the word Google and the exact phrase “tips and tricks”. This tip is so beneficial especially when you want to find the exact and precise information about the topics that you are looking for. By using quotes, you simply eliminate all the unwanted and irrelevant pages and links from Google search results so you can save more time. Are you looking to for free to use images on Google? Before talking about how to use free to use images on Google, let me tell you one thing. Most bloggers still pick Google images and use them within their sites without worrying about copyright issues. Stop doing that practice if you’re doing it (when you’re writing blog posts). Make sure you’re using copyright-free images so you won’t get sued. Here’s how you can find free to use images on Google advanced image search. Click on Advanced Search to continue. You’re done! That being said, why use images within your blog posts? Blog posts that use images get 96% more social shares. And social shares increase your traffic and search engine visibility. So if you want to get more search traffic along with the social shares, you must use appealing images that are relevant to your blog topics. And make sure to only use those images that don’t have any copyrights, otherwise you’ll regret later. How long has it been since you went through all the posts that you published? Is it a month? Several months? Or long back? If you’ve NOT updated your old blog posts for a long time, now is the right time. Seriously, why create new posts when your old content is not bringing you any traffic? If you’re still not convinced about updating your old posts, here are few reasons to do it. Why update your old blog posts? Here are few strong reasons to increase your search traffic by updating your old blog posts. Updating your old blog posts can give you a chance to enhance your blog’s overall value. You can remove typos, outdated content, grammatical mistakes and what NOT? Search engines value error-free content and puts that content in top search results almost always. So undoubtedly updating your old content is one of the best Google search tips and tricks you can use. You’ll get a chance to increase your blog’s design appealing. You can add more images, include videos or infographics to make your content even more appealing. Always remember that, blog posts with images usually get more social shares. You can also add tweet this button while updating your posts so you can get more retweets. Come up with more relevant keywords and insert them while updating your old contents. For me, this is the #1 reason to update my old content. Almost every single time I do keyword research before updating my old blog posts. That way I bring in more search traffic for a variety of relevant keywords. Remember that, search engines always give more value to old blog posts (because they are on the web for a long time) but make sure your old content is still relevant and highly informative. While updating your old blog posts, keep an eye on your comment section too. If there are any blog comments that look spammy or don’t add any value to your existing blog posts, remove them ruthlessly. Once you’re done with updating your old content, make sure to use Google crawler (fetch as Google) from your Google webmaster tools for quicker indexing. How to update your old blog posts for better SEO? Here are few tips that you must use while updating your old content to bring more search value and increase your overall website traffic from search engines. The first tip is to update your old posts frequently and regularly. If a post went live a year ago, make sure to update it as quickly as possible. Don’t neglect it. The most important thing to consider while updating your old posts is to use Google analytics. Find out all the top 20 pages that are bringing you more visitors from search engines. Those are the posts you need to start working on immediately. While updating your blog posts, make sure to remove all the outdated information that’s no longer makes sense to the present day. Make sure to add relevant and fresh content to bring more search value to your content. Make sure to interlink to several other pages (recently published contents) while updating your old posts. That way, search engine crawlers will crawl your site more efficiently and you’ll get even faster search rankings. Repurpose your old posts. If the content or topic is really good, you can turn it into infographics, eBooks, videos and what NOT? Just spend more time to increase visibility of your existing content by distributing it into various mediums such as infographics. Also make sure to start building links from guest posts or skyscraper technique to your old content to get higher search rankings. If you’re a blogger what’s the #1 thing that you want? More traffic from search engines, right? Yes, website traffic from Google is the currency for every blogger. But the hard part is getting traffic from Google is NOT easy unless you attract a lot of quality and relevant backlinks. So how do you get quality backlinks to your sites? I’ve a simple tip for you which is one of the most underrated Google search tips and tricks that can help you get a ton of backlinks whenever you publish new content? Build and grow an audience that will get you natural backlinks. Don’t just focus on link building. That’s the BIGGEST mistake most bloggers make while building links to their sites. Instead, focus on relationship building. Grow your audience. Find relevant bloggers in your niche, comment on their posts, write guest posts for them and you will slowly start growing your network. Most popular bloggers like Neil Patel, Pat Flynn, Ramit Sethi get backlinks without even trying. Do you know why? Do you know their secret? The secret is simple: they attract backlinks naturally to their sites because they have a huge audience that links to them naturally whenever they publish new blog posts. Backlinks is one of the most effective Google search tips and tricks that you can use to attract more traffic. That being said, if you’re looking for proven link building tips, here are 3 of them which work like magic every single time. Create infographics: People are still not recognising the importance of infographics even though they attract a lot of quality links from other sources that help you improve both your SEO and search traffic. Use tools like Canva to easily create infographics. Make sure to add custom embed code by including link to your site so people can easily embed your infographics and you’ll get a link whenever they do so. Guest posting: Although Matt Cutts said guest blogging is dead long time back but it’s really not yet dead. Still people are using guest posting effectively to build quality links to their sites. Just make sure NOT to write guest posts just for the sake of getting links. Also use them for building relationships with other bloggers and to bring more traffic to your sites. That’s how you can be safe with guest blogging game. Create case studies: Whether you know it or not, case studies are link magnets. They can easily attract more traffic, shares and backlinks. The reason they work so well is because they focus on facts not on random fluff. The best example is I wrote a detailed case study on SEMrush and talked about how it helped me boost my search traffic, it attracted a lot of traffic and sales. So if you want to boost your SEO, case studies is one of the most effective Google search tips and tricks you can try. Although there are a ton of SEO tools out there but here are 2 SEO tools every blogger MUST use if they want to increase their traffic and sales. I’ve been using both SEMrush and Yoast SEO for a long time now and I’m getting incredible results in terms of both traffic and sales so I highly recommend you to check out these two tools. Let me give you a brief description about these 2 tools as they are one of the most effective Google search tips and tricks. SEMrush: If you’re reading Bloggers Passion for a while, you already know that I use and highly recommend SEMrush. If you only have to use 1 tool, make this tool to your companion. It can be used to do everything from competitor research to keyword research to backlink analysis to site audits and what not? WordPress SEO by Yoast: On page SEO is one of the most effective Google search tips and tricks you can use to bring more traffic from search engines. Here’s where a free tool like WordPress SEO by Yoast comes into handy for doing on page optimization. It’s an easy to use tool that can help you easily optimize your content for specific keywords. You can read my WordPress SEO by Yoast free vs premium guide to know more about how it works. Let me tell you one of the less known Google search tips and tricks that most people don’t share with you: if you’re a blogger, don’t just limit your content creation to text. 90% of the blogging, SEO, marketing related content is filled with textual format of content. Why just create text content when you can reach out to wider audience by using videos, podcasts, infographics, webinars etc? This is the right time to start focusing on other channels as well if you want more traffic. You must realise the importance of using other platforms as well. To be precise, you can’t ignore video marketing i.e YouTube. YouTube is the 2nd biggest search engine after Google but rarely bloggers are focusing on using it to create and promote their videos. If you’re still not creating videos on YouTube, you should probably start doing it from now on. That being said, instead of doing random video creation, focus on turning your top 10 high traffic blog posts into videos. You can either use slideshares to create videos or simply get in front of a webcam and start talking about the tips that are shared within your top blog posts. Just make sure to include links to your original blog posts in your video description. Also make sure to increase your channel subscribers, video likes and comments on YouTube. That way you will get more views. Make sure to optimize your title, meta description and tags with a primary keyword so you can get higher rankings even on YouTube. Keyword Density: Does it Matter at All in 2019? Using Google effectively is one of the best things you can learn to save more time and use resources more efficiently. I hope all the top Google search tips and tricks mentioned on this post helped you. If you’re a blogger, I know increasing Google traffic is not easy. It takes time and more importantly takes a lot of efforts such as link building, keyword research etc that’s why you need a tool like SEMrush. So make sure to check out it and let us know your thoughts. Do you have any more of such Google search tips and tricks that save time and use Google search even more better? Share your thoughts in the comments below. Thank you so much for this list, i have been wanting to start writing quest post for other blogs for some time but don’t know how to go about it, how to contact them, how many post is too much or too few, and I also need names of some sites that allows others to post on their blog. Finding your site today has made my wish come true. Great tips, especially for those of us who are trying to improve our SEO. I actually went back through my archive of old posts and updated a lot of them. It took a lot of time, but it was a necessary thing to do. Hopefully, by making these changes last week, I’ll see an improvement in my Google traffic. I know that it takes time to notice any changes, but I can’t wait. I personally haven’t heard of Google voice search. Pretty amazing that we can now do a search on Google without having to type anything on our keyboards. I agree with you and no longer stress about link building. I know that links are important, but in the past, I stressed about building links to my blog. Yes, I do guest posting and I love it. However, I don’t do it merely for the link building purposes. I do it because it helps me build relationships online. As I start getting my name and blog out on the blogosphere more, I am noticing an increase in my blog traffic. So guest blogging definitely works, you just have to give it time to see the effects. You have written a awesome stuff. These days people like voice search most. And the best part of the content that I liked most is repurposing old published post. We should repurpose our old posts. I will really increase our traffic. Thanks for the guide. Great SEO tips you have shared here. Re purposing and updating the old blog posts can definitely add value to the post and rank it better in search engine result page. I have recently updated some of my old posts and its really increase my blog traffic. Thanks a lot for bringing these great tips here. Great tips on Google Search! It is true that more and more people are now using only their voice to do a google search. I would say most of my friends use their voice to search on google. I like your tip of updating old blog posts. That is something I haven’t really thought about. It is a smart and great idea. I have also recently learned about Internal Linking and how that affects your rankings as well. Interlinking within your blog is also a ranking factor for the google algorithm. They are just like backlinks!